The Eastern Shore Board of Trade, District 19 was formed in November 1954 at St. John’s Hall, Oyster Pond by a group of local businessmen. Throughout most or all of the board’s existence, District 19 included the area of the Eastern Shore stretching approximately from Smith Settlement in the west to Ship Harbour in the east. To the southwest, District 19 included the areas around West Jeddore and Lower West Jeddore, while to the southeast it included all of the land west of the Ship Harbour inlet including Owl’s Head and Nichol Island. The northern part of District 19 stretched from Jeddore Lake to Grand Lake in the west, across through Ship Harbour Long Lake, and from Scraggy Lake through Dreadnought Lake to First Lake in the east. 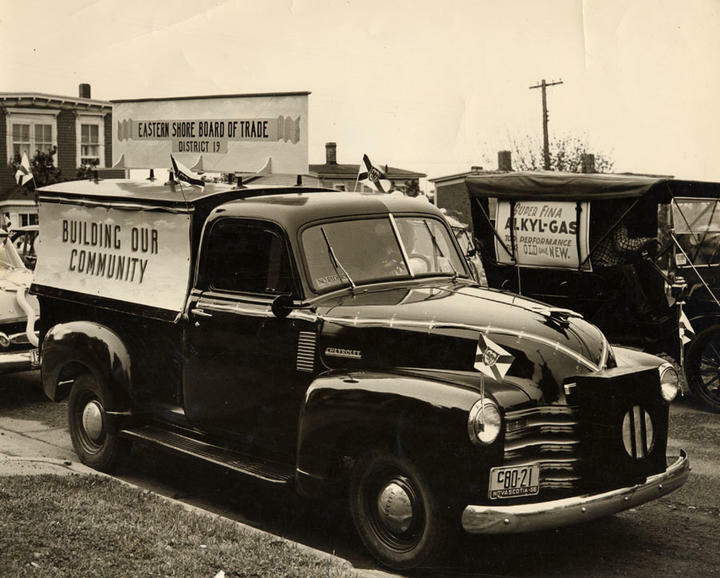 During its time, the board busied itself with promoting local interests and causes, including lobbying government officials to combat local safety hazards and promoting the local economy and tourism. The board also sponsored and participated in various community events, and established a recreation centre at Lake Charlotte. In about 1959 the board set up its permanent headquarters in Oyster Pond, probably at the Hosking Store, which was owned by Garth Hosking, who served as the board’s first president. In the early 1960s the board increased its cooperation with two other boards of trade: the Musquodoboit Harbour Board of Trade and the Sheet Harbour Board of Trade. Sometime after 1966 the board disbanded, with some of its members possibly transferring their energies to the Musquodoboit Harbour Board of Trade. Most of the records were kept in the Hosking Store, Oyster Pond, beginning at some point while the board was still active. The records probably remained there until 1995, when the Hosking Store was dismantled by the Lake Charlotte Area Heritage Society. The records were then transferred to the basement office of society chair Gordon Hammond’s house in Clam Harbour. In 2003, most of the records were transferred to the Eastern Shore Archives. A portion of the records were also transferred in 2010. Photocopies were made of most small-sized newspaper clippings, in which cases the originals were removed. Donated in 1995 by Mildred Hosking, wife of former Board President Garth Hosking. A small amount of records were also donated by Garth Hoskings daughter Elaine Dooks in 2008. Records from the later accession (number 2010.019) are arranged separately. Records donated by Elaine Dooks were originally accessioned with the number 2008.006, but were re-accessioned with the number 2009.037 at the time of cataloguing. A scanned copy of the photograph exists in the photo database. Researchers are asked to view the scanned copy of the photograph as opposed to the original. Variant names of the Board which appear in the fonds include Eastern Shore (District 19) Board of Trade, and Eastern Shore "District 19" Board of Trade.